Postero medial slipped disk causes lower back and often leg pain. Postero medial slipped disk means the bulge is in the axilla, or armpit, under the nerve root. 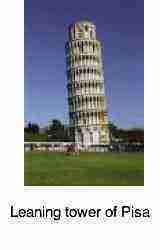 Sometimes you may take up an antalgic posture; in this instance leaning towards the pain which I call the Pisa sign. However many disc patients do not go into an antalgia. It's an ominous sign and, controversially in my book, I think the person who finds himself looking like a question mark should stay home and have massaging bed rest coupled with exercises. One of the bizarre signs of this condition is that some people oscillate. They go to bed leaning to the left, and wake up in a right antalgia. It's particularly difficult clinically as your chiropractor may have to change the manipulation completely. 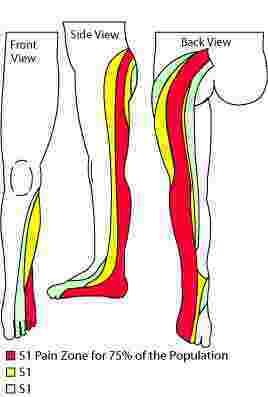 Bulges in the lower lumbar spine affect the sciatic nerve; the pain and tingling tends to go down the back of the leg. Any weakness usually affects the foot and ankle. Are you able to lift your big toe? And can you raise your heel and stand on your toes on the affected leg? In the mid lumbar spine any herniation would likely affect the femoral nerve; pain and tingling affects the front of the thigh and inner lower leg. Any weakness would cause the knee to give way, particularly on the stairs. Coughing and sneezing are usually painful, and can seriously aggravate the condition, and your chiropractor will be looking for a positive Valsalva manoever. Together with bearing down on the toilet, these constitute the so called Dejeurine's triad. Notice the disk bulge in the 'armpit'; under the nerve root. That's the postero medial slipped disk. I both love and hate treating patients with the medial herniation. Why is that? Because they usually respond much more quickly than the person with the lateral disc; he leans away from the pain. Patients with a medial prolapse think I have golden hands. However there's that big question mark. It's a big one; will you go on doing your exercises? Both the medial and the lateral disc herniation take six weeks to heal with chiropractic care, assuming you go quickly to him when you know you've done something serious to your back. Reducing the bulge before the swelling and inflammation set in makes all the difference. Interestingly, research proves that you have a significantly greater chance of ending up under the knife if you first consult your medical doctor; of course I'm partisan but there's strong science backing it up. Now, let's consider that question mark. Because the pain is nearly gone in ten days or so, you stop the program of treatment, forget about the lower back exercises and go back to tennis, golf and gardening; before those fibres of the annulus have healed, and whack, you injure the disk again just as it's healing nicely. Research shows that far more postero medial disc injuries end up in surgery than lateral disks. But they really are much less problematic. If you go through with the Chiropractic Help, do the rehabilitation, and wait out the six weeks, then you can expect a good outcome. How do you know whether you have a medial or lateral disc injury? Sit in an upright kitchen chair and slowly straighten first one leg parallel to the floor. Lower the leg, and now raise the other foot until the limb is parallel to the ground. If it causes no pain then you can place increasing tension on the nerve root by slowly flexing your head onto your chest, and then dorsiflexing your toes; pulling them towards your body. This test should really be done passively; in other words, someone else should raise your leg, and dorsiflex the ankle. It's known as the Slump test for sciatica. If raising the opposite leg increases the pain more than raising the leg on the painful side, the so-called crossed sciatic sign, then you may have a postero medial slipped disk injury. Say for example you lifted a heavy cupboard and developed sharp right lower back pain. If then, while doing the Slump Test, straightening your left leg causes more pain than straightening your right leg, then you probably have a medial disc protrusion. For more about the Slump test click here; you can do it at home with the help of a friend though interpretation of the results can be tricky. Was is often confusing is the old gold standard straight leg raise of Lasegue sometimes produces results at odds with the Slump test. Lower back and leg pain go hand in hand. If the bulging disk reaches the Sciatic or Femoral nerve then you will experience pain, tingling, numbness and perhaps weakness in the limb. This is true whether it's a postero medial slipped disk or a lateral disc. 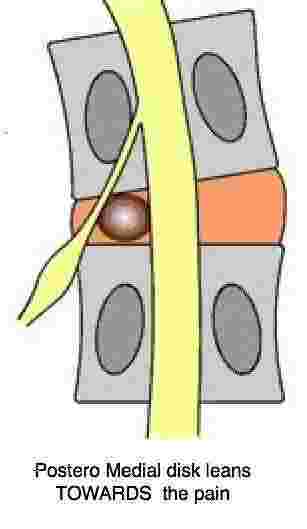 The sciatic nerve affects mainly the back of the leg, calf and foot, whereas the Femoral nerve supplies the front of the thigh and the inner lower leg. Either way it's serious. One of the most challenging conditions at the chiropractic coalface is sciatica without back pain. It can cause profound disability and weakness in the leg and, if chiropractic treatment is to succeed, do not delay. This patient was lucky, only because he came within days of onset. The precise diagnosis is often difficult in the absence of scans which because of the cost are usually not immediately available. Whether it's a medial slipped disk, or lateral, both a femoral nerve lesion and sciatica without back pain are usually very difficult. Whilst chiropractic has magic moments, and this is particularly true of the postero medial slipped disk, most of the pinched sciatic or femoral nerve conditions that cause severe leg pain require dedication on the part of the DC and compliance from the patient. Your chiropractor will not win if you are not following the slipped disc rules and the specifics of your condition. If you are not willing or able to adhere to your chiropractor's requests, then it's best in my opinion to go straight to the surgeon; the chances are they he won't win. And if are not willing or able to adhere to the surgeon's instructions, then you are faced with the prospect of failed back surgery, or FBS; it's not uncommon in the case of the uncompliant patient; sometimes, no matter what the circumstances, you simply have to stop. And if you don't adhere to your chiropractor's requests, then you are in serious danger of falling into what is known as the Failed Back chiropractic file. Every person with a postero medial slipped disk must take it seriously, stop whatever you are doing for at least a few weeks, do the exercises, go for treatment, or bear the consequences; disability and lifelong pain. If you have found this postero medial slipped disk file interesting and useful, you will enjoy my Bernard Preston books; they are about real people who have had these problems, cunningly disguised to hide their identity. They are fun books really; about the amusing and interesting, and sometimes tragic things that happen at the chiropractic coalface. Light bedside reading. Only $4, help me sell a million! Really, this is a great book, and even if you don't like it, only $4 is lost. In Stones in my Clog you'll learn a lot about the Dutch people and why this is such a powerful little nation. I left so many friends behind. They are much cheaper e-editions, to be enjoyed on your tablet or Kindle. You could read it on your PC but that gets a bit tiresome.